Brewing Kombucha is a truly enjoyable experience. Also, it’s very easy. I usually make Kombucha out of regular black tea. I just boil 3 litres of water in a pot, drop 4-5 tea bags, wait till the tea gets strong and take the teabags out. I mix n a cup of sugar and wait till it cools down. In the meantime, I sterilize jars with boiling water. I don’t have a special continuous brew container (yet!) so I use normal 1-litre jars. It is VERY important to sterilize the jars for Kombucha. It will be explained why, in my next post. I make it by pouring boiling water into the jars. Primary fermentation stage of brewing Kombucha. When they are sterilized and cooled down, I rinse my hands with vinegar (you cannot use soap) and place pieces of Scoby in them, along with about a cup of already brewed Kombucha. I pour the sweet tea I made before up to the necks of the jars. I place a piece of cloth or paper towel (forgive me that sin ZeroWasteChef!) and secure with a rubber band. After a week, I taste the tea with a straw. If I cannot taste sugar, it means that my tea has turned into Kombucha. The most extreme Kombucha geeks check its pH with the litmus paper; it should be between 4.00 and 2.5. No, I am not doing this (yet!). 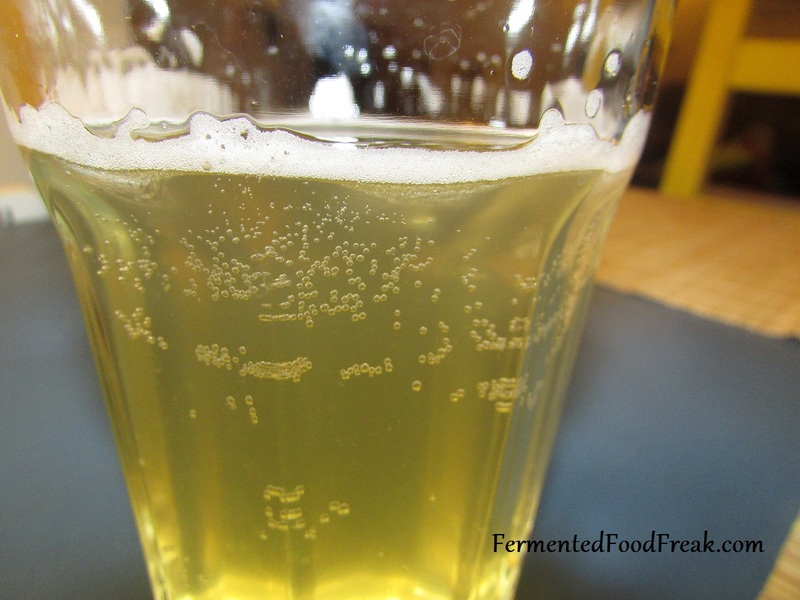 Brewing Kombucha – the secondary fermentation. I strain it into bottles and cork them for secondary fermentation, which is not a necessary step, but makes Kombucha taste better. The bottles must be corked to stop acid forming and to enable carbonation. Now is a good moment to flavour your Kombucha. I love it with peach pieces, but then I have to use a jar or a wide neck carafe instead of a bottle. Or cut peaches rather finely. You can add ginger, watermelon, pear pieces, berries, any fruit juice, vanilla, nettle, mint, prunes or whatever you fancy. Amazing recipes for flavoured Kombucha. 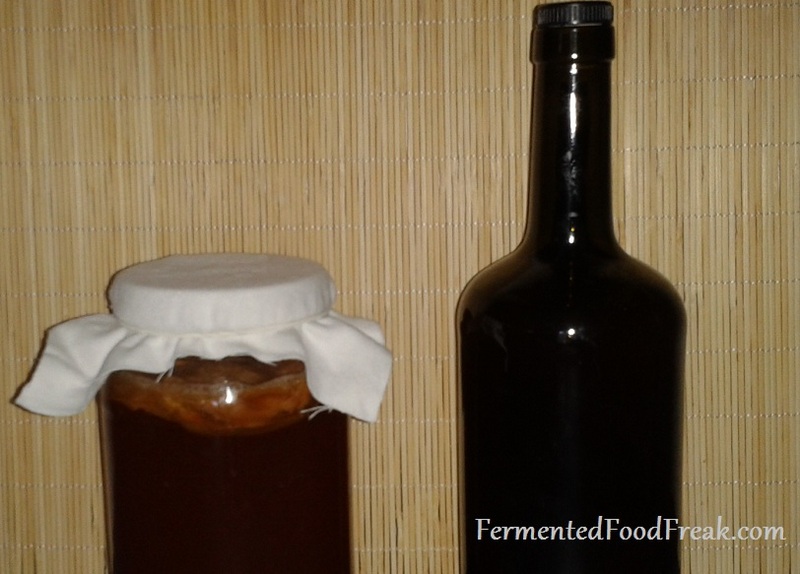 So, at this stage, you will have bottles with ready or almost ready Kombucha and jars with the Scoby. It is very important to leave a bit of Kombucha along with the Scoby. Leave around one cup, if you are just going to pour the sweet tea to the same jar and continue the fermentation. However, I leave two cups because I divide my Scooby in two and transfer one piece into a new jar. Remember to sterilise the jar and rinse your hands with vinegar. 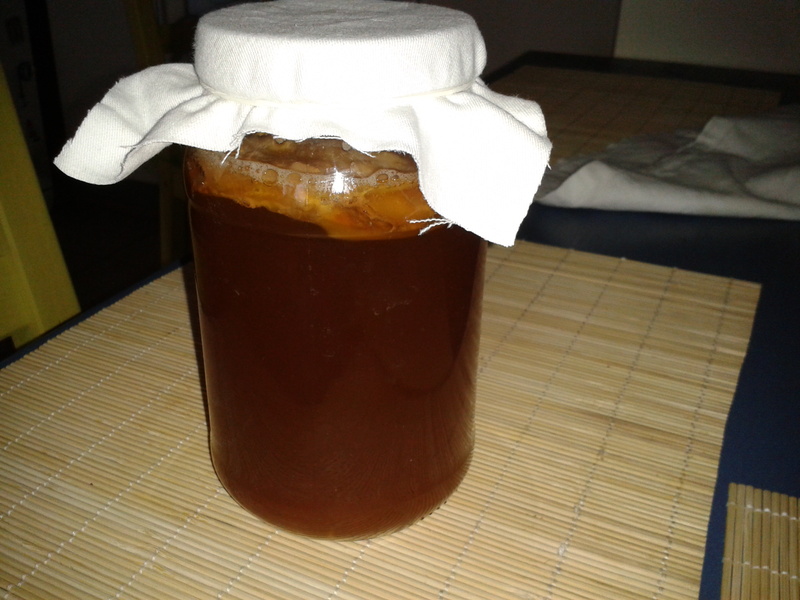 It is possible to divide the Scoby because it grows during the fermentation. This is why I love making kombucha. It is so pleasant to watch something growing! I got a sample of Scoby big enough to brew one liter of this miraculous drink and now I have around ten jars with a well-formed mother in each of them. I am not very strict about how long to run the secondary fermentation. It can be one day or one week. So, sometimes it will be nicely carbonated and sometimes completely flat if it happens to be freshly bottled. See my last post for the ways to drink and enjoy Kombucha and to learn why it is good for your body. I wrote this post at the beginning of my Kombucha adventure. At the moment, I am over 100 bottles wiser and have just written some advanced tips . Previous Previous post: What is Kombucha?